The main protagonist of the Unpacked event on 20 February was Samsung's first foldable smartphone, the Galaxy Fold. The Korean manufacturer confirmed that the device will be available in the United States and Korea from April 26, but did not disclose the dates for the rest of the world. Now, they have finally been confirmed. There's less and less time left until we get our hands on foldable phones. The Galaxy Fold, the first flexible device from Samsung, together with Huawei's Mate X, are the great protagonists of this first generation. If you live in a European country (or the UK) you are in luck - Samsung has confirmed that you will be able to buy the Galaxy Fold from April 26 at 8:00 GMT. As previously mentioned, you will be able to place your order for the Galaxy Fold on April 26, and just one week later, on May 3, it will already be on sale in the main specialized stores. The list of countries is extensive. In addition to Spain, it will arrive in the United Kingdom, France, Germany, Italy, Sweden, Norway, Denmark, Finland, Belgium, the Netherlands, Austria, Poland, Romania and Switzerland. In the UK, Samsung has partnered with EE for the launch of the Galaxy Fold. Conor Pierce, Corporate Vice President, Samsung UK and Ireland said: "Samsung is delighted to be partnering with EE to bring the incredible new Galaxy Fold to the UK market. With the Galaxy Fold, we didn’t just change the shape of the phone. We pushed the boundaries of innovation to change the shape of tomorrow." 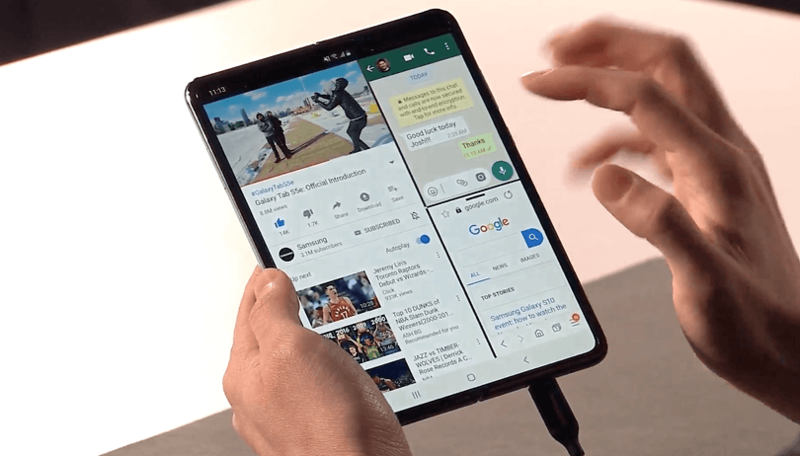 We remind you that the Galaxy Fold has a screen of 4.6 inches that once unfolded increases to 7.3 inches; it sports a SoC Snapdragon 855 (curiously does not come with an Exynos version), 12 GB of RAM and 512 GB of storage. In addition, it has a total of 6 cameras: one on the front cover, two on the inside and three on the back. There's still no word on price, but the package includes the new Galaxy Buds wireless headphones (worth €149), a Kevlar protective cover, and one-year Samsung Care+ insurance. The Galaxy Fold will also be available in four colors: Space Silver, Cosmos Black, Martian Green and Astro Blue. So, after the US and South Korea, the Galaxy Fold lands in Europe and the UK. But it won't stop here, as Samsung has confirmed that it will soon launch its foldable smartphone around the world. Do you think it will be a success or is it still too early for this technology? Let us know in the comments.